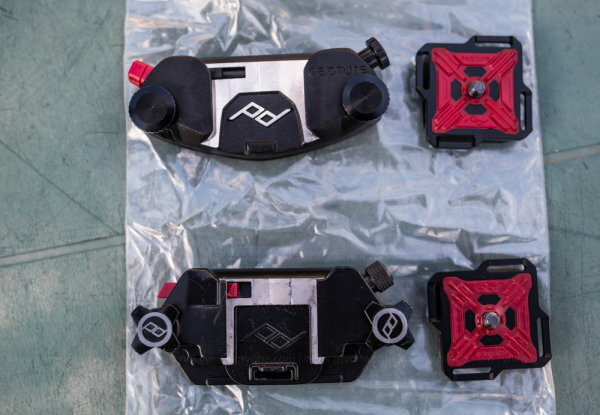 Peak Design meets it's funding goal for Capture Camera Clip V2 with $819,108 pledges on Kickstarter Congratulations! 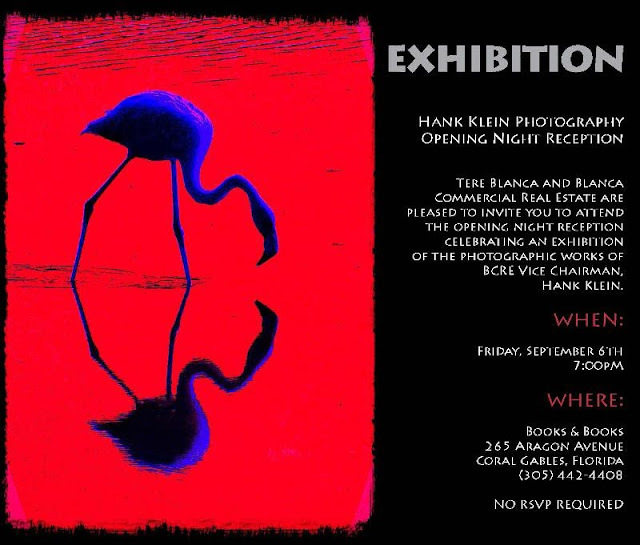 Opening Night Reception: Celebrating the Photographic Works of Hank Klein at Books & Books September 6. Hank Klein Photography Opening Night Reception at Books & Books September 6th 7:00PM 265 Aragon Avenue Coral Gables, Florida. 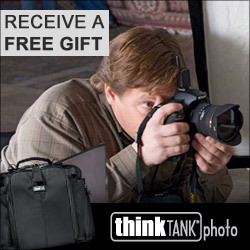 August Special: Free Camera Strap and Support Kit with Purchase of Think Tank Photo Back Pack. 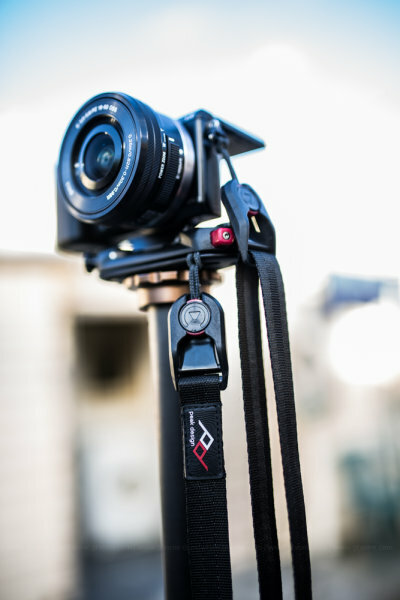 The Camera Strap V2.0 features non-slip material on both sides so the strap will not slip off the shoulder, even if the strap is upside down! 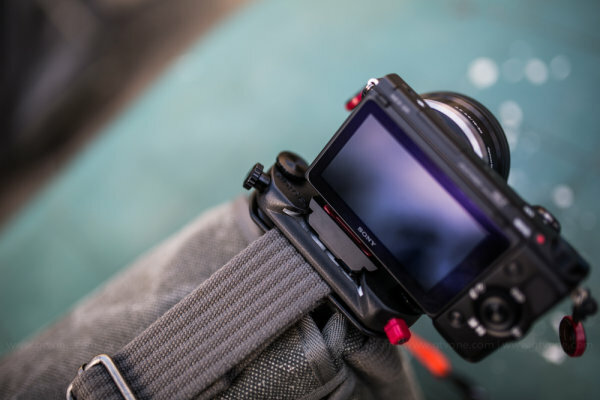 Designed for less bulk and increased portability, the Camera Strap V2.0 also attaches to Think Tank backpacks by using the Camera Support Straps (included in kit). Using this kit is a convenient and comfortable way to attach one or two cameras to backpack straps. First place winner is Will Fagan! Second place is Patrick Fallon! 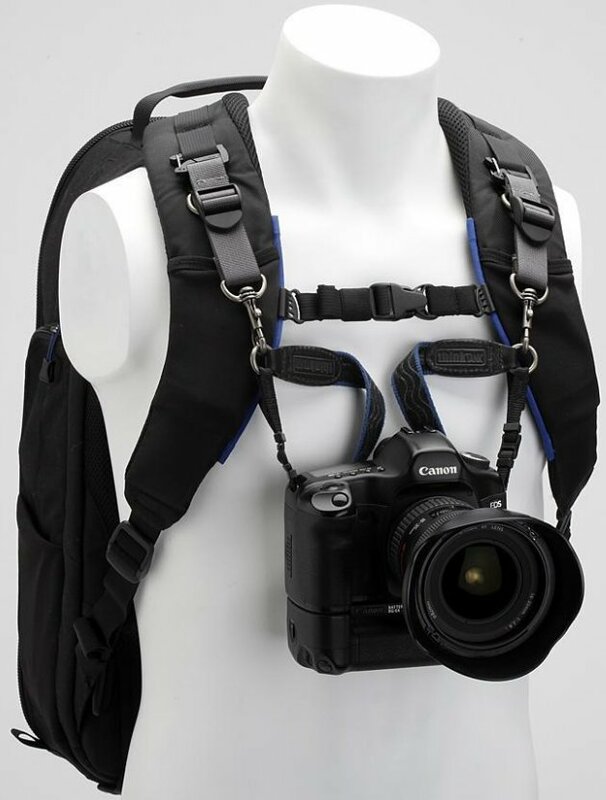 Think Tank Photo Mirrorless Mover 10. 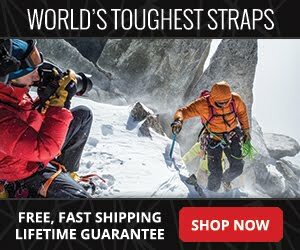 Peak Design Cuff Wrist Strap. Third place is Karen Vaisman! Entrants were asked to post comments on which one of four photographs they would choose for publication. There were a total of 132 entries. 1. Brett Flashnick I would go for #2. Tight is right in this instance. Wider images don't offer any more context than #2. 2. Chuck Burton Number two...great expression, nice tight action. 5. David Hearne No.2. It is the most energetic and because it is near the rim most suggestive of a powerful dunk. The physicality of Lebron is emphasized. However, I would want a an image before this one. As a sports editor I would not use any of these. 6. Thomas Staub I would select #1. It nicely shows that in this situation the San Antonio Spurs are powerless / helpless to prevent the Monster slam of LeBron James. Number 21 is far away. In addition, #1 shows the full power of the dunk. 7. John Simpson #4 since it shows context (in the air, near the net, frustration, minimal people noise), that some of the other shots don't show. All great shots, but some are definitely better than others. 8. Jean-Pierre Mogniat Duclos I pick #4, I like the proximity and the action, the face of the man. 9. David Tulis I'm going with the "tight is right" version number 2, top right. Nice flick by the way! 10.John Lechner Number 3, it conveys the motion/action plus gives a real feeling of flying. I love this shot. So much to look at from LeBron's face to the ball, his body position to how far he is off the ground. 12.zZLiana Lehua I like #3, because it conveys more info about what happened with Tony Parker looking defeated and easing up. It shows LeBron still elevated. 13.Wellington Guzman I'd pick #1 based on the opponent and how useless it is to try to catch up to him, how fast he's moved up the court, and the power of the dunk. 14.Jose Antonio Prieto I Like number one. Dad needs a New pair of glasses. 15.Heidi Christensen I would go with #4. You see that he is jumping but you can also see his reaction; it shows the moment fully that he comes in contact with the ball. 16.Jake Valerio I would choose #3 because I like to see everything in a shot and it really how's how far up he actually is. 17.Brian Davidson I pick number two because its peak action and the crop is the tightest. It also has the cleanest background. 18.Will Fagan #1: Great face, good action, beaten opponent in the background. The opponent in the back makes the image better than the rest, and helps tell the story of the Heat winning the game. #3 is too far from peak action to be the story, with too much dead space at the top. The composition of #1 leads you through the image the best. 19.David Seelig I would pick number 2 it has more impact then the others I like seeing his face so up front. 20.Arletta Cruzan Number 1 - "Hey, I can do this all day long." 22.Sword Bomber Photo 3 coz he is not connected with the ball... he looks like doing 'Air Bending' (The Last Airbender movie)... and he is on air. 23.Fuad Azzad The best option is the 3rd one. Is the only image in which the ball is not in contact with the body – an important feature in basketball. On the other hand, it tells a complete story by including the referee, the coach and the player of the opposite team. This places us in a real game where the action is taking place. The movement presented by this photograph is of a hand moving towards the ball, as oppose to the others where the ball is hitting the body. The intentionality of the player is best perceived the third shot. 24.Carl D. Schumacher I'd go with #1. You get the sense of power that the other shots show, but with the opponent in the background, there's more of an overall story. The other player is trying to catch up, but you can see the full perspective of the court, making him and the other end very small. 25.Craig Sheppard My eye is immediately drawn to #2 but I would publish #1. For me #1 puts the player in context. You can see the court, the other players, the crowd and the hoop. 26.Jesus Haces I'd go with #1. His outline traces a nice diagonal. 27.Tzehau Tong Hey Al, I would publish the #4 because it has better angle shot. #4 shows the lebron's whole body dynamic movement right after the moster jam in the air. Besides, the angle of shot catches lebron' s no. 6 on the shirt and the miami heats logo clearly and nice. 28.Alex Eberhart I would pick picture 2 because it gets you up close shows how high he got off the ground by how close he is to the rim. 30.Jay Loden I guess I'll be the odd man out, I'd go with #1 myself. None of these are bad shots of course, but #1 looks almost like ballet! The different angle makes his feet look crossed like he's doing a graceful pirouette, opposing team player in the background for context, ball positioning works better for me, and as a bonus you've got a cool diagonal line with his body drawing the eye right through the frame. 31.Simone Renoldi n° 2... it's more direct, no distraction about the backgrounds. It goes directly to the target! 33.Gary Cosby Jr. It has to number 2 if I am a photo editor. Image number 2 is the tightest shot and gives you the ball, the face and the arms with a clean background. My second choice is number 1. If I have space to play with I go with number 1 because I like seeing the separation LeBron gets with Tim Duncan trailing way behind. That kind of makes a statement all its own. 34. 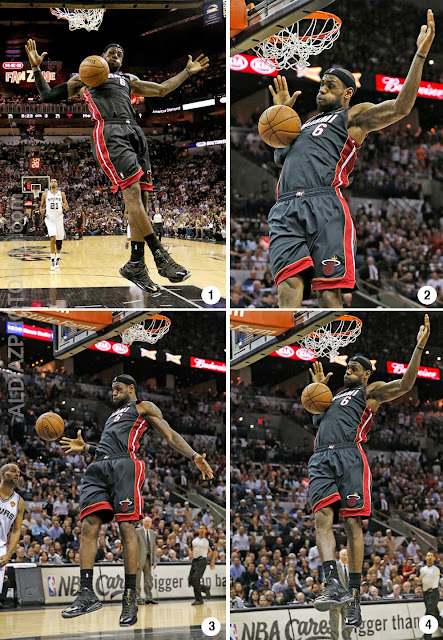 Erika Muller love the facial expression of LeBron in photo 2. Also, it has the cleanest background and depicts the shot block perfectly. 35. Gregory Antonio Castillo Photo 2! 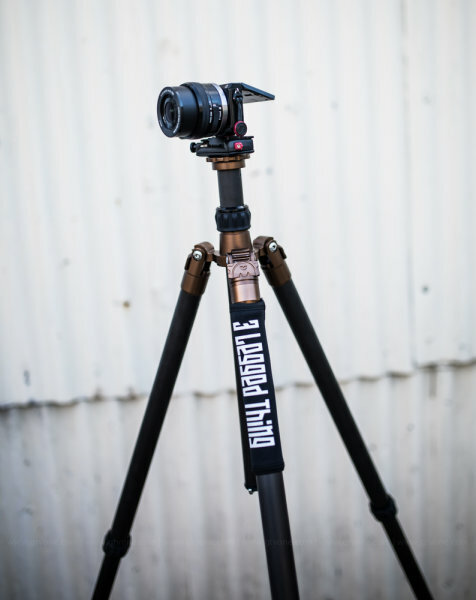 The tightest zoom fills the frame perfectly and puts the viewer right where the action is. 36. Richard Shumaker I think the first image (#1) tells the best story - you have more fans showing, the "Fan Zone" on the big screen and the opposition way back down court staring somewhat in amazement with a "what now" look on his face. The complete package. 38. S Garcia I would fly with number 4. The one frame tells a story. The details are enough for the viewer to decipher what took place with interest. Besides being a cool shot, it also has some great details. 39. David Emm Number 2 all the way. It shows the immediate aftermath of the dunk, the background is clean, there is enough else in the image to show the surroundings, but not to be distracting, and the crop is tight enough to draw attention right to the player and yet not feel cramped for space. In number 1 the player in the background is a little distracting and the shot isnt wide enough to show the height off the ground which doesn't do the body position justice. Number 3 you have the player popping in the side of the image and Mr James is too far down after the peak moment to show the dynamism of the dunk. Number 4 doesn't show the enough of the floor so you get no real impression of height off the ground. 40. Paulo Gomes I agree the 2nd has quite an impact, but... I would choose the 4th, just because it gives a better sense of the enviroment, with the packed audience, the player in mid-air and the referee trying to catch up with the play ;) its a much better story then the 2nd. 43. Jeremy Glover #2..Cleaner background. You see his facial expression better. It tells the story better..That the ball just came out of the net. Other photos have too many distractions such as other people or signage that takes your eye away from the main focus of the shot. 45. Doug Searles I would choose photo number 4 since it shows the whole body of LeBron James after the monster jam. Not only that but it actually will show exactly how far off the ground he was to show the height difference. Also as you look into the background you can see the opposing coach and his frustration. Also by having LeBron in focus throws out the fans in the stands but it gives you that larger than life feeling and shows how much each of the game. 46. Kitty Mason Number 2 is my pick! Shows everything you need to see to know the story of that shot and captures a close up of his brawn. 47. Bryon Cole I like #4, its got all the action and expression in one frame. The background is just as important and you can see how he was captured in mid-air. The net has some nice motion and the look on his face is priceless. 48. Tony Pegg I would post photo number 1 for its dynamic angle. 50. Chuck Eggen No. 2. I like the crop. Shows more emotion. 54. Rusty Burroughs I like the close crop of #2 .... Powerful! less distracting background and facial expression is great. 56. djdanny ray Great site . I could spend day and night talking and reading about photography. Keep it going. Thanks. 57. Phoenix Spiritdiva I pick #4. Love the CU and #4 captures it all. . . from the jump to the spread hands to the chest bounce/toss that won the shot. . . you captured the magic of this winning shot...LBJ and your photo. 58. Tom Collins I would vote for #2. It is a tight shot which isolates LBJ. You see his face, expression, and the number on his jersey. The background is clean and undistracting. The location of LBJ's arms suggest that the goal was made through divine intervention. 59. Joann Biondi Number 2, because I like looking at his arms. 60. Phelan Ebenhack I like photo #2. Peak action, reaction. And I'd run it big! 62. Ray Whitehouse I like photo number three the best because you have the referee, Greg Popovich and Tony Parker adding context to the frame. 63. 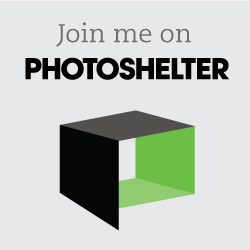 Mark Wallheiser Photography #2 would have been my first image moved. 64. Andrew Williams I would pick #2. The other 3 photos have some distracting elements such as the other player who is not relevant in #1, and the NBA signboards in #3 and #4. Photo #2 places the greatest focus on the most important elements - the ball, the hoop and the player. It also allows you to see his face and expression, which gives the viewer a greater connection with the moment. 65. Adam Nikoletsos Number 1. Showing Tim Duncan in the background after the dunk makes LeBron look even better! 66. Joshua P. #4 is what i would have ran. Nice work Al. 67. Philip Chan 1st one has the best pose/angle IMO. The other 3 are similar but are from a side angle. 68. Rica Espiritu #2 Aside from the shot being "tight", concise and showing everything that the person needs to know, coming from a 'print' background, even if this pic gets printed as a thumbnail, it gets the message across. You don't have to blow it up or get a full page view to see what you 'need to know'. As long as the photo gets the message across, that's what I will pick. 69. Billie Beltran pic #1, full frame shot, he is in the air with a full house behind him. best part is like he is "Shot and Nailed In The Air!" 70. Charles Simmons #1 would be my choice for publication. It shows the moment of confirmation of the end to me. Showing a Lebron James far ahead of the opposing team with Tim Duncan watching helplessly from the background but also showing Lebron to be leading the pack with a Miami teammate in the background witnessing the slam unfold. It portrays the dominance the we all witnessed Lebron showing down the stretch of the 2013 NBA Finals by showing him as, pun intended, playing leaps and bounds above not only his opponents but also his own teammates. The composition also draws the reader in close to the action but still shows an interesting backdrop with the dejected Spurs fans in a moment of foreshadowing of San Antonio's eventual collapse. By showing the reaction, or lack thereof, of the crowd, the photo exudes the feeling of "Dominance" to me and speaks emotionally and photographically in the perfect way to describe the play that Lebron and the Heat showed throughout the year and on their way to the repeat. I think all four photos are fitting but #1 does the best job of combining all of the elements needed to perfectly describe the Miami Heat's 2013 Season and Championship Playoff run. 71. Simon V #2 Best facial expression shot. 72. Jim Merchant I would select #2 as it fully shows his facial expression and crops out the manager between his legs. Its the old get in tight and fill the frame with the subject! 73. Christofer Lindkvist I would go with #1 for a few reasons. It's the only one you can see anyone else from the game and you might figure out what he's thinking and it looks like Lebron is enormous and is standing on his toes. Fantastic picture! 74. Scott Sideleau When in doubt, go with the tight crop. I'd go with #2 because it shows the action (just after the slam dunk) without any other distracting elements or opportunities for misrepresentation (e.g. #1 almost looks like he's dancing on the court in a bad PhotoChop). 75. Spencer Pablo #3. His full body's in the shot, and you've got crowds and ref in the shot. Also, because it also looks like he's playing volleyball or can pew-pew balls from his chest. Multisport. Diversify. 76. Luis Sytsma #4 shows him the moment after throwing down, his pose still contains a powerful look and the court is cropped out so it seems hes still high up there. also the pose isnt awkward as the other photos. lebron is the leader of the team, lebron #4 with good composition and poise. 77. Jonathan Abrenica I like #1, Duncan in the background seems fitting. Would of picked #4 but I don't really like how Popovich is peaking between his legs. 79. Matt Wicks I would opt for Image #1 for storytelling purposes, as it shows Tim Duncan far behind on the court, representing the Spurs trailing the Heat. Great options here. 80. Marcel Bauer I am really digging pic #4, the expression, frozen movement are perfect. I can totally hear the roar of the crowd. Great capture. 81. Anthony Marshall I would choose the first picture. I like the body posture of LeBron and how he is slightly at an angle with his hands in the air like "Thats how we roll". I also like how you can see Duncan in the back behind LeBron probably super blown. So in conclusion I like the fact that his whole body is in the picture, you see the court and the crowd. 84. ‪Peggy P I would choose #4. It looks like a cover shot. LeBron looks like he's floating, he's well-centered, and the ref and fans are visible. That shot makes me feel like I'm there. 85. Kent Nishimura Hrm. tough choice...i think i'd select 3, definitely if it was cropped a heckuva lot tighter. there are some definite possibilities with frame 3. it's just difficult to say with the photographs being small. 86. Elan Kawesch I'd go with number 2. The crop at the knees is not a huge deal, and by doing that, you get a better background than the rest, and a better view of Lebron's face. For the cover of a sports section, it has an instant "pop" that will draw readers into buying the paper. 87. Ibrahim Cetindemir I would publish #2. You see, photo # 1 tells the story but the net seems distracting. I can say the same thing for #3. The player on the left, the ref and the guy in the suit all draw me away and clutter the frame. As for #4 its a great capture, but we don't want the lettering on the bottom, nor the ref, let alone the guy in the suit. Thats why I would had also cropped photo #4 and publish #2. 88. Patrick Fallon Looks like #4 is the pick here, though I'm curious what more reaction shots might look like. 89. Andrew Nelles #2 - Tighter and cleaner. The clear winner for me. 90. Christopher Trim I'd go with #1. I like the reverse angle as it shows Tim Duncan in the background and helps to establish that this was shot during the NBA finals. 91. Carlos Rodrigues I will number 3, just because the face of disappointment of the Spurs player, give the both sides of the story. 92. Stephen Mally I would go with #2. Peak action, tight, and good background separation. 93. Matt Gade 2nd, Tighter and better facial expression. Background is more compressed and not as busy, no coaches behind his legs as in 3 and 4. Might even crop from the bottom to just over his waistline or just under his right arm. 94. ‪John Williamson Al, these are all superb images... the type that sports photojournalists dream of catching at just that right time. Extremely tough decision, but with only one to pick from, I would have to go with number 2, as it perfectly capture the emotion that LeBron James had to be feeling at that precise moment! 95. Lou Novick Hi Al, I pick #2 as the best, I can't leave a comment on your blog don't know why. 96.Jose Dominguez Photo #3 is the winner to me. The story is there. Lebron is there full body, Parker comes into the pic. and the referee and the crowd is in the background. the others so it has greater impact. The great expression is not lost. Nice Job Al. 100. Angelique Carter #3 it looks like a pic that would b in the magazine. Its something about the ball off to it self and then him at a diagonal. that shows the power over the ball. 101. Tom Burton I'd go with #2. The frame is closest to the moment of the dunk and for the later frames, it's not as apparent that he made the basket. The expression reads better from that angle compared to #3 and the tighter crop makes it read quicker. And if the hole on the sports front was a horizontal, you could hack a crop from that one, though not without a bit of pain. 103. Michael Lopez Hi Al, I would pick number 2. It's a good close up of Lebron after he dunked the ball and you don't need the rest of the body to tell the story. His facial expression is great and I am right there with him... that is my choice. 104. Rick McCawley #2 is it! 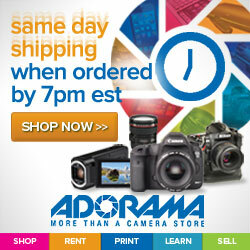 Impact emotion composition make this a sure thing lead photo run BIG. I'm sure other published photos would frame the complete story in support of this decisive moment. 105. Nicholas R. Von Staden It's door #2...tight crop and run it BIG...let the reader see his emotion. 106. Erik S. Lesser Numero Uno, because it shows the opposition too. 108. Karen Vaisman #2 shows the expression and the crop of the arms are leading lines drawing you into the face and puffed out cheeks. The background is more blurred and less distracting. Although 2 and 4 look like the identical image, the #2 crop is much more powerful. Excellent job! 109. Sarah Hoffman #2 I like the clean background and it brings attention to the moment without the distracting background. Maybe seeing some reaction in the background would add context but in this case the expression and moment has the most impact. Awesome catch! 111. Lawrence Zicherman I like #2. They are all super shots, but I'll tell you why I like this one: They all have great expressions on their faces, but I like two things about this one. First, I like the way he stands out from the crowd -- the blur of the crowd and the shadow on them, while the court lighting on LeBron really sets him apart. The other reason is that it has the best image of the net "resetting" after the ball went through, so there is no question that the ball had just fallen through. 113. tod grubbs Hi, I would choose shot #2, it is closeup, a bit more drama than the other shots and shows more emotion of the player as the ball bounces off him after the slam dunk... 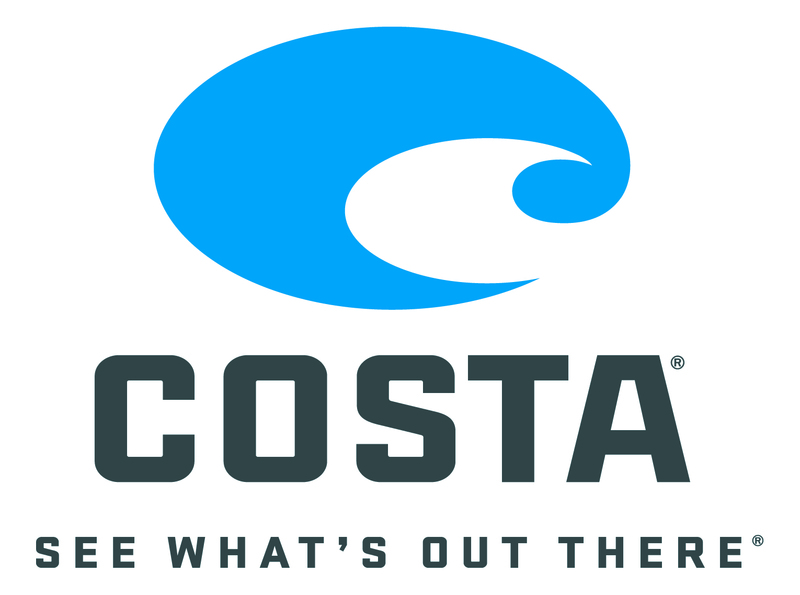 IMO!!! 115. Pat Mahoney Mahoney Definitely image number 1. A nice full body shot in mid-air with the arena environment allowing a lot of depth. And with the opponent in the back ground at or near the 3-point line Lebron seems to out-distance the opposition! Color is terific as is the highlights on hie face and left shoulder/arm! 116. Jeffrey Reedy The number 2 for the composition, his expression, the angle, is a perfect shoot, your mind can see that he is in the air without see his feet! 117. Aaron Srader I like the fourth pic because it captures all the elements of the shot. To me it has better composition..
118. George Guba #2. I think the medium closeup emphasizes his effort and strength. It captured my attention. 119. Tara Kafle Really good. Its live! 120. Michał Czekański I would choose 2nd one, to my opinion it shows the best expression + it's also a tight shoot. It doens't contain any distracting elements as well as it has the nicest composition. 123. Brandon Larkin I would publish #4. It gives him a cocky kind of look and I think that matches his public image well. 124. Michael Clevenger I'd pick #4. I think #4 shows his proximity to the rim better, with his feet in the frame and the net still in disarray from the stuff. 125. Brandon Larkin I would publish #4. It gives him a cocky kind of look and I think that matches his public image well. 126. Zsolt Repasy I'd select #2 as the face is really expressive, there are no disturbing elements in the image (narrow cropping). 127. Jin Huynh 2 is the best depiction of an epic dunk out of the four. The close angle looking up at LeBron shows how he's larger than life (the blurred crowd behind him). His hands up like that, to me, is body language for "Boom! There it is!" 128. Deborah Gray Mitchell I prefer #3...I like that it has both a Spurs player and a referee, it shows his feet are definitely off the ground and I like that the ball is in the air. Yes, #2 is good too but it could have been shot at any game. 129. Richard Gibson #2 - looks like the basketball is glued to LeBron's chest - I love sharp sport's images! 130. George Quiroga #2 - This image crops out some of the distracting elements from the full frame and focuses the viewer on the emotion and intensity in LeBron's face. Yet there are still enough background elements to show a packed house. I also like the composition with the arm diagonally leading up to the corner to give it more of a dynamic. The energy seems to be concentrated in the triangle between the hoop, the ball, and LeBron's face keeping my gaze in that area. 131. Hal Yeager #2 for sure. It's tighter, good expression and the lighting is good. Has the three elements that make a great picture. 1) Quality of light, 2) graphically pleasing, plus doesn't leave any room for a page editor to destroy it. 3) Invokes and emotion. It says wam! bam! thank you mam! Which def leads you to believe they won the game. 132. Mark Elias No. 2: Big impactful image which shows the heat of the moment (yes, pun intended) in Game 4. Background is too distracting in other images. This gets the point across to the viewer in less than a second, while the others have you thinking "well how did LeBron get into that position? How could he let that happen? etc etc.